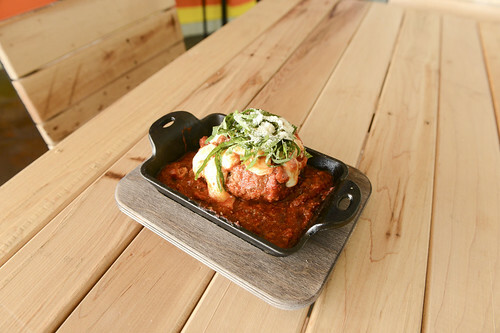 There’s a new oceanfront restaurant in Lahaina that’s aiming to change the way you eat pizza. Pi Artisan Pizzeria doesn’t look different at first glance, and it has all the great smells of an Italian restaurant, but the way you order is unique. You don’t even have to be at the restaurant or on the phone: they have an Android and iPhone ap called Pi808 that could be the future of ordering food. You choose the time and the items on the ap, and they will have it ready when you arrive. You can also order from their website, but they don’t deliver. Another striking feature that you will notice when you visit: this is build-your-own pizza, in a fashion Subway has made famous. But here there’s no big corporation in the background. 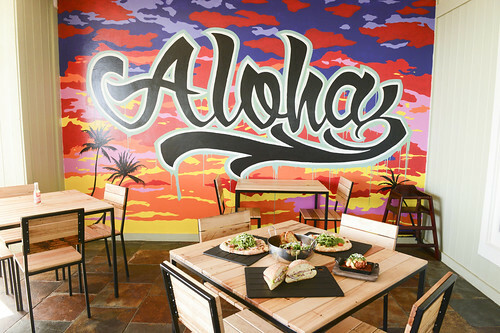 Pi is all homegrown stuff, from the toppings to the mural painted by local artist Desmond Kaleolani Alexander. The restaurant also has lots of pre-selected combinations you can choose from–just go straight to the “The Classics” or “Signature Pis” sections of their menu board. 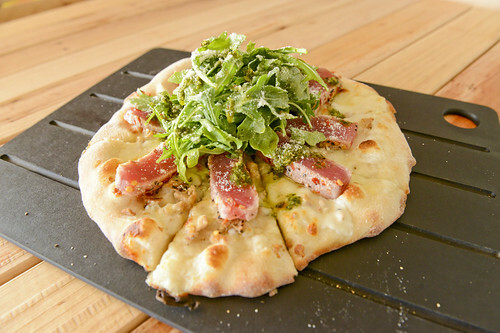 One of the signature pies already taking off is their Seared Ahi Tataki: arugula, balsamic, blanco sauce and their housemade buffalo mozzarella. Raw fish and cheese never tasted so good. But Pi has more than just pizza. 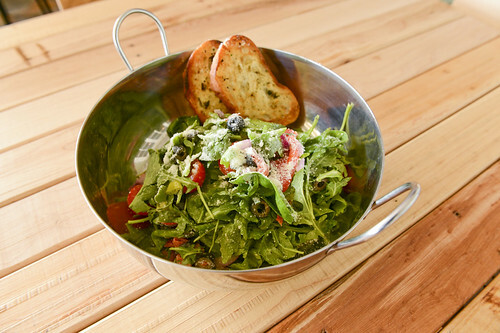 The Pi Chop salad is a wonderful bowl of arugula, roasted peppers, olives, spinach, red onion, peppercorn and Romano cheese. The homemade Butcher Meatballs has also been a surprising hit. The bread dough goes through a traditional three-day kneading process in their 65 degree temperature-controlled room, where they also break down their meats. Speaking of which, the Pi Panini menu has a Muffuletta sandwich stuffed with arugula and salami, a Meatball sando, and a spellbinding Porchetta. The savory meats enveloped in Pi’s crusty bread are filling and satisfying. But it’s the make-your-own pizza concept that’s brilliant, especially if you’re a vegan or vegetarian looking for just the right combination of veggies (though Pi also offers plenty of meat toppings as well). 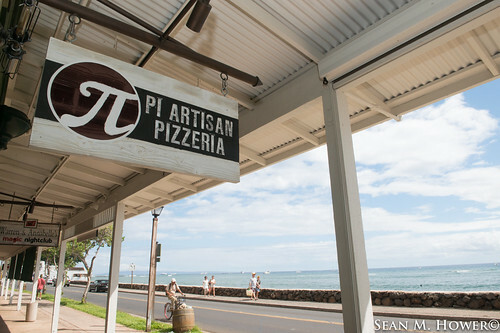 Pi recommends no more than four toppings, and once you order they take less than five minutes to cook in their custom-built Sicilian kiawe wood-fired oven. We tried shrimp, arugula and mushroom with Maui olive oil. The newest Pi on the menu is the Pi 3-Some. That incorporates meatball, sausage and pepperoni and it’s one of Bert Noury’s creations, along with the Creole and Forrest pizzas. Noury is another partner at Pi and a manager on the floor. 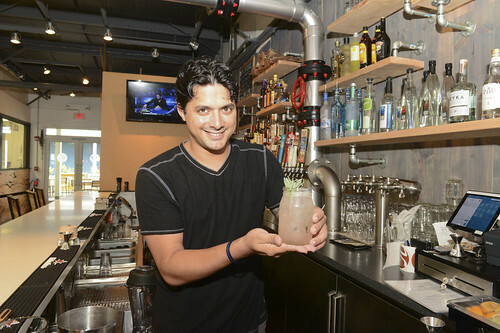 He also created the beverages and bar experience as well. 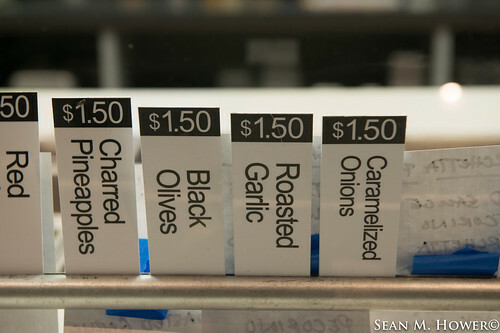 Noury and Hanley travelled across the country, tasting pizza concepts and picking and choosing the best ideas for Pi. Initially they thought that they would open their concept on Oahu, but the old David Paul’s Island Grill spot on Front Street caught their attention. For more info or to order from Pi, go to Pi808.com. Right now Pi Artisan Pizzeria has a Grand Opening sweepstakes on their website where you can win a year of pizza and a bicycle.